With social networks like Facebook and YouTube assuming a greater role in people’s personal and work lives, Canon’s new line of consumer camcorders seeks to accommodate that trend by enabling easy shooting and online posting of better video faster. At CES on Monday, Canon announced six new high definition camcorders—three compact Vixia HF M-series models and three entry-level Vixia HF R-series models—offering an assortment of new, built-in capabilities, including Wi-Fi. 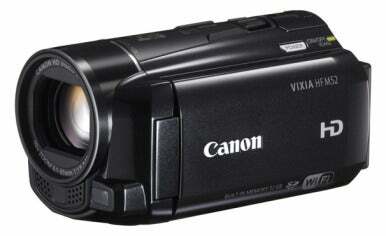 Overall, the camcorders have similar feature sets, but they differ in terms of built-in memory and Wi-Fi capability. The two lines also have different sensors and form factors. All the new camcorders offer improved low-light video capture and a new Intelligent Image Stabilization (IS) system. This system dynamically detects action in front of the lens to automatically trigger the proper settings to reduce camera shake. 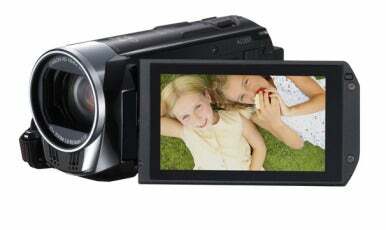 All the camcorders feature a three-inch glass touch panel screen with an improved menu system and button layout. And all offer the choice of capturing videos in MP4 or AVCHD file format. Some models offer Wi-Fi connectivity and full Digital Living Network Alliance (DLNA) compatibility. The MP4 file format option makes it easier to share content across mobile devices and online social networks. DLNA connectivity allows wireless transmission of videos to DLNA-compatible HDTVs or game consoles. HF M52, HF M50, HF R32 and HF R30 let users export content directly to an external hard drive via an optional USB adapter without a computer. The HF M52, HF M50, HF R32 and HF R30 all have built-in flash memory and Wi-Fi capabilities and facilitate direct upload of videos and stills to YouTube and Facebook, or to mobile devices such as an iPhone or iPad via Canon's new free Movie Uploader app. The new camcorders retain features from previous versions, such as Smart Auto Mode, which detects and analyzes brightness, color, distance, and movement to automatically select the best of 38 available pre-sets for a recording. The Touch & Track feature allows users to touch any subject on the LCD screen with their finger so the camcorder will track it to ensure proper focus and exposure. The camcorders also include built-in stylistic Cinema-Look filters. Some new models feature Relay Recording for uninterrupted video recording from one memory source to another. Models with built-in memory feature HD-to-SD downconversion so users can convert recorded high-definition video to standard-definition files while preserving the original HD footage. Each new model is also compatible with Eye-Fi SD memory cards for wireless uploading of video to a computer, social networking site, or video sharing site. The HF M52, HF M50, and HF M500 camcorders are housed in a compact body that is 15 percent smaller than previous M series models and shoot full HD (1920 x 1080) video. This series has a 10x HD video lens and an enhanced HD CMOS Pro image sensor that boosts low-light performance by 20 percent, according to Canon. The HF M52 and HF M50 have 32GB and 8GB of internal flash memory, respectively, and feature HD-to-SD downconversion, Wi-Fi, and DLNA capability. The HF M500 has no flash memory or Wi-Fi, but records directly to a SDXC-compatible card. To assist new users, Canon has incorporated a new Audio Scene Select menu to streamline custom audio selection. Users select the environment being captured—for example, a musical performance or a speech—and the camcorder will automatically adjust settings, including microphone directionality, frequency response, wind screen, volume level, and microphone attenuator. Users can also choose to make audio adjustments manually. A new accessory is available for the HF-M series only—the Canon WP-V4 Waterproof Case. This compact and lightweight housing seals the camcorder, allowing easy on-camera operation and control for water sports shooting, and protects the camcorders in depths of water up to 130 feet. The M52, M50, and M500 camcorders will be available in March for $750, $650, and $550, respectively. The WP-V4 Waterproof Case will be available in March for $599. The HF R32, HF R30, and HF R300 camcorders, which are 21 percent smaller than the previous R-series cams, target budget-conscious consumers. These entry-level models offer full HD (1920 x 1080) video, 51x advanced zoom, a 3.28-megapixel, full HD CMOS Image Sensor, a 3-inch full-flat Touch Panel LCD screen, Touch Decoration, Smart Auto and Advanced Video Snapshot features. The HF R32 and HF R30 incorporate 32GB and 8GB internal flash memory, respectively, while the VIXIA HF R300, with no flash memory or Wi-Fi capability, records directly to a SDXC-compatible memory card. The HF R32, HF R30, and HF R300 will be available in March for $550, $450, and $350, respectively.